When SWEENEY TODD opens on 10 October 2015, it will only be the second time in 32 years that the songs of Stephen Sondheim would have been heard in a Pieter Toerien Theatre. It starred the glorious Judy Paige, the inimitable Andre Hattingh as well as the dashing Eric Flynn who also made his directorial debut. The occasion was a rather grand one too. 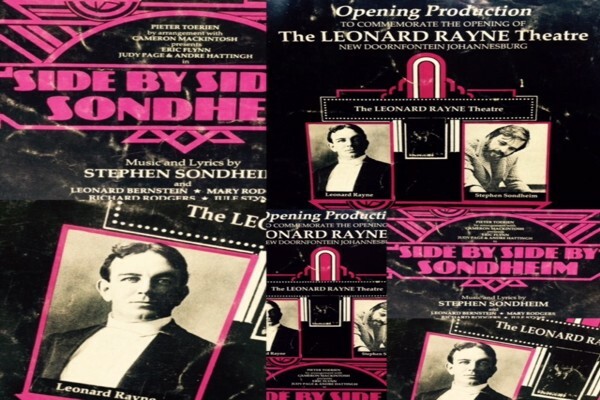 It was the official launching of The Leonard Rayne Theatre at The Alhambra Theatre Complex in New Doornfontein Johannesburg. Making the then single theatre building into a 2 venue theatre complex complete with a new rehearsal room, dressing rooms and a bar, ADAM’S, named after Adam Leslie, downstairs that served pre and post show drinks and meals which became quite the spot! Glorious days indeed! 32 years later the Stephen Sondheim masterpiece that is SWEENEY TODD, presented by Pieter Toerien and KicksART Productions comes to Pieter Toerien’s Montecasino Theatre in October and early 2016 to the glamorous Theatre on The Bay in Cape Town. Starring Jonathan Roxmouth and Charon Williams Ross, with an extraordinary ensemble featuring some of our brightest musical theatre stars, a lavish and memorable score and a gripping storyline, SWEENEY TODD’s dark brilliance will be nothing short of breath-taking.